Britt and Bella love living near the beach. But the normal fun in the sun doesn't compare to the wonder of discovering a nesting sea turtle. When the girls learn that the sea turtle and her eggs could be in danger from a sand sweeper machine, they try their best to protect their new turtle friend. Standing up to rude workers and showing courage beyond their years comes naturally to the girls as they find a reason to be brave. Sea Turtle Summer by Nancy Stewart is a delightful children's book. I loved the friendship and courage of Britt and Bella. The story is engaging and the illustrations by Samantha Bell are soft, yet colorful. The message about the importance of protecting these beautiful sea creatures is certainly worthy of attention. Included at the end of the book is a list of information about sea turtles that I found interesting. The information complements the story and can provide a launching point for discussion with older children. 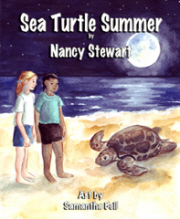 Sea Turtle Summer is recommended for ages 6 to 9, but I think children as young as 3 or 4 would enjoy the story and illustrations. Disclosure of Material Connection: I received this book free as part of the PumpUpYourBook Blog Tour. I was not required to write a positive review. The opinions I have expressed are my own. I am disclosing this in accordance with the Federal Trade Commission’s 16 CFR, Part 255: "Guides Concerning the Use of Endorsements and Testimonials in Advertising." Thank you for hosting me on your lovely blog today. And thanks for the kind words about Sea Turtle Summer! Thanks for hosting Nancy today. The first book in this series, One Pelican at a Time, was awarded the Literary Classics Seal of Approval. I hope your readers get a chance to check out the Bella and Britt books.